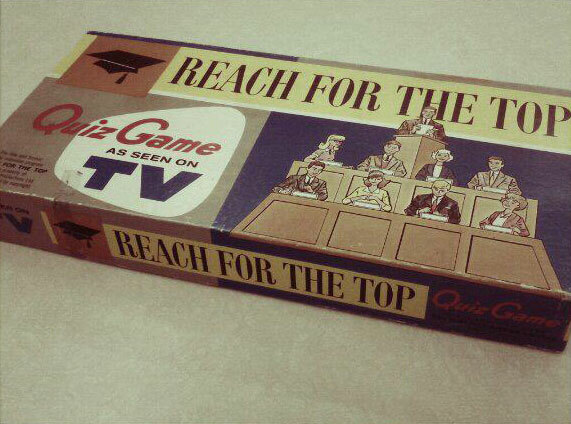 The first National Finals of Reach For The Top were played in 1965, and it became a national T.V. show in 1966, with separate local productions across the country and national finals series played by the regional winners. Teams from Vancouver, Edmonton, Regina, Saskatoon, Winnipeg, and Toronto played that inaugural series in 1966. The finals taped in Montreal and hosted by Bill Guest. For five decades since then, thousands of students have played “Reach for the Top“. In 1968, an experimental and international version of the game called “Trans-World Top Team“, was developed as a joint production of the BBC and CBC. Twelve Canadian students from Toronto, Ottawa and Montreal went to the UK for five games , and then five games were played in Canada. 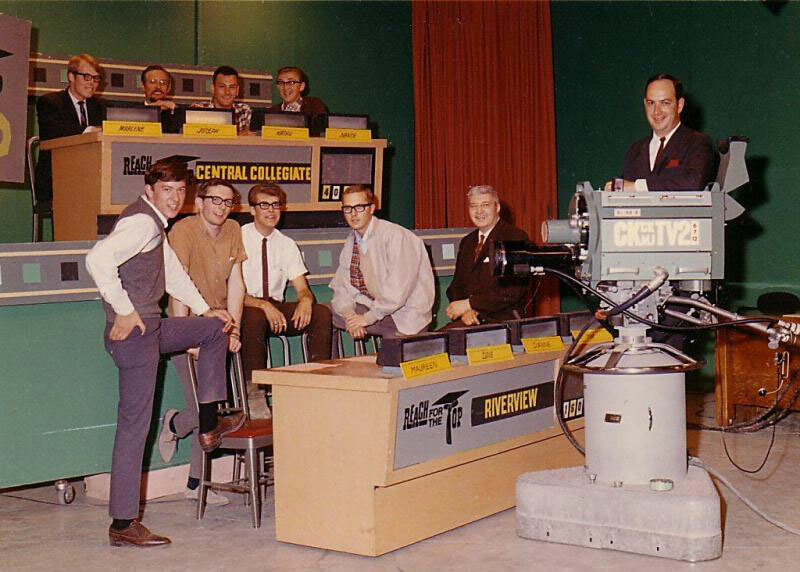 Geoffrey Wheeler and Alex Trebek were the quizmasters and Sandy Stewart was the producer for the CBC. In 1971, Paul Russell became writer and editor for Reach For The Top and he has continued as National Editor to this day. A French language version of the show was developed by Radio Canada in the 1970’s as “Genies en Herbe“. In the early 1980’s, the top “Genie” team was invited to the Reach National Finals, for a bilingual competition against french-speaking students on “Reach” teams. “Genies en Herbe” has been discontinued by the CBC. There is a francophone “Genie” still being played in Belgium! In 1984 “Reach” became a private show in syndication under the aegis of producer Sandy Stewart. 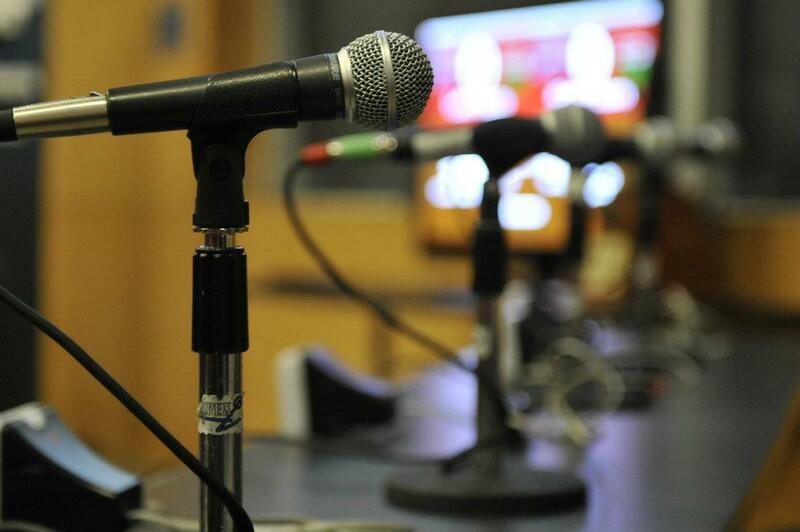 Broadcasters have included TVOntario, The Knowledge Network, Access Alberta, Canadian Learning Television (CLT), Bragg Communications, Winnipeg Videon, Rogers Cable, CHCH Hamilton, and CFPL London. Our current national broadcaster is Canadian Learning Television (CLT) with studios in Edmonton, Alberta. Also in 1984, Sandy and Patricia Stewart joined with Paul Russell and Robert Jeffrey of Paulus Productions to produce the “Schoolreach” subscription program for in-school competition. 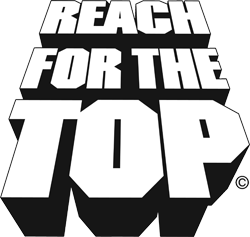 Without the glare of television lights, the “Schoolreach” version of “Reach for the Top” has been played by thousands of students for over two decades, with its top teams invited to play “Reach for the Top” on television. The National Championship trophy, designed by sculptor Dora de Pedery Hunt, is the eagerly-sought prize, the pinnacle of “Reach” achievement. For five decades, “Reach for the Top” has been a significant part of Canadian culture, even the subject of the CBC T.V. movie “Pray for me, Paul Henderson“… a coming-of-age movie that linked “Reach for the Top” and Paul Henderson’s winning goal in the eighth game of the 1972 Canada-Soviet hockey series. In 1995, Sandy and Pat Stewart retired from Reach For The Top. Reach For The Top and Schoolreach are owned by Reach For The Top Inc. under the direction of Paul Russell. 9:30 am games begin. This will be a day-long tournament with break, concluding at 4:30 pm. McMaster University Student Center (MUSC), 2nd floor. 1280 Main St. W., Hamilton, Ont. Parking in Lot B just off the Stirling St. entrance. Spotlight from the 2018 Nationals. The official National Championship Game is now available. See the top players representing University of Toronto Schools and London Central. We look forward to the upcoming games in Toronto this May. Reach For The Top shared a post. From 'Old Toronto' FB page: Alex Trebek hosting a tv gameshow in Toronto in 1967 between Leaside and Monarch Park High Schools. Opportunities are now available for like-minded organizations to partner with Reach For The Top to celebrate our 50th Anniversary.